I'm trembling as I type this. I've just discovered one of the world's most horrible secrets. I've unearthed a fact that can possibly destroy several millennia worth of human progress and evolution. On a personal, physical level, this discovery has reduced me to a quivering mass, and my now-gelatinous brain is unable to process or consider anything except for what have I just found out. On a larger scale, there's no telling just how much destruction I can single-handedly cause by revealing to the world what I have now spent many hours researching. But the truth must be told. So what is this awful thing that I speak of? Johnny Turbo is a real person. Let the shock wear off. Give it a few minutes. There, you okay? All right. Now, I know that you don't believe me, since you should now be in the denial stage. Don't worry, it's nothing to be ashamed of; it's just your sanity's natural self-defense mechanism kicking in. However, because of this, I am required to submit evidence that backs up my assertion. Take a few deep breaths, then when you're ready, click here. I know, I know. It's okay. You'll be all right. We just need to get through this together. Here's the story. Last night, I was poking around Google, looking for information on Johnny Turbo - mainly to see if anyone had already scanned and mocked the Johnny Turbo ads. See, I had wanted to continue working on my Johnny Turbo article, but first, I needed reassurance that what I was doing wouldn't end up being (too) redundant. While I was happy to find that there was no one else on the internet who had previously thought to deeply analyze Johnny Turbo and his bizarre homosexual propaganda, I was, to put it mildly, incredibly disturbed when I stumbled across Steven Lashower's page. This website is notable for a few reasons. For one, there's a screenshot of Star Wars Arcade's ending, which I never thought I'd see with my own eyes, since the game is unbelievably, maddeningly difficult. Another thing is that on the same page, it is revealed that a shield-replenishing code, which would have made the game at least finishable, initially existed in the game, but was removed from the final version. This fact, along with a statement on the site's main page that reveals that he worked on Eternal Champions and the Saturn port of Mortal Kombat Trilogy, makes it plain to see that Steven Lashower is history's greatest monster. "Overseeing the project down at our end was John Brandstetter (Johnny Turbo)." It can't be, you may think. This man is merely insane, claiming that a fictional character produced his game. How laughable! Ha ha! No, friend. This is no laughing matter. As I found out last night, through another Google search, there really is a guy named Jonathan Brandstetter who works in the gaming industry. Yes, Johnny Turbo is real. He is a real, living person, and he walks among us. 2) This summary for Lose Your Marbles, a SegaSoft game. I've never heard of it, either. John Brandstetter is listed as the executive producer for this game. 3) This cached page from archive.org (the current version of the page lacks any mention of Brandstetter - conspiracy, anyone? ), which reveals the critical information that John C. Brandstetter currently is "The vice president and TCPT programmer of Flying Tiger Development." Another search turned up the official page for Flying Tiger Development, but this is unfortunately where Brandstetter's trail runs cold. No mention of the man is found on the site, and there is no more information to be found on him anywhere else on the internet, either. And I searched very thoroughly, let me tell you. It's interesting to note just what kind of games Flying Tiger is responsible for, though. Listed on their past projects page is the universally-panned Time Crisis: Project Titan, a classic example of what every gamer hates: an installment of a good Japanese game franchise that was programmed by an American developer. Also on the page is No Rules: Get Phat, an awful Gameboy Advance game which could have been more accurately titled "Menace Beach 2002." Enough of my half-hearted berating, though. We have learned much today. The knowledge that you now possess may destroy the world or...well, it's only good for destruction, really. 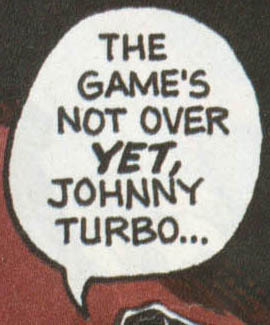 Anyway, you now know that Johnny Turbo is in our midst. Whoa, keep cool, man. Though your first instinct may be to travel to 1901 E. Lambert Road in Somewhere, USA, with a cross in one hand and a wooden stake in the other, I urge you to put off whatever holy mission you may be about to embark upon for now. We need him alive. I know it's hard to go on living with the knowledge that Johnny Turbo walks the earth with you, but there are things to be learned from Brandstetter...if we can find him, that is. I don't know about you, but I want to know just what his deal is. 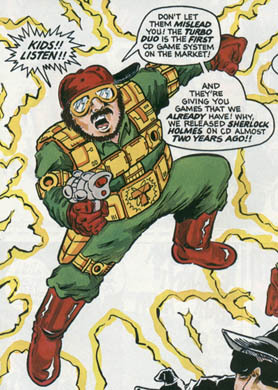 Did this man really provide the inspiration for Johnny Turbo, as I suspect he did? Does he have any idea of how the Johnny Turbo ads came into being? Was he involved in their development? And...does he really look like Johnny Turbo? The journalist in me wants to interview this man - this legend - very badly. I know the interview, if it ever happens, will eventually degenerate into me prodding him for the 'real story' between him and his life partner Tony, but I still want to at least email the guy or something. He could answer all of our questions; he could finally shed some light on just why the world was exposed to the terrible images contained within those advertisements so many years ago. We could get answers, finally! Or this could all just turn out to be one big coincidence. But if anyone reading this has the ability to track down the real Johnny Turbo and get me in contact with him, please do so. And John Brandstetter, sir, if by chance you're reading this...please, oh please, please e-mail me. The world wants to hear from you. Only you can answer our burning questions and help us sleep at night.